We had some friends over for dinner this weekend. The theme was Italian, with Lasagna, Bruscetta, and Oil/Vinegar dipping sauce. I had seen this recipe on Allrecipes.com, and was instantly hooked. I decided to use my muffin top pans and make individual "pillows'. Let me just tell you... Wow. These are little pillows of heavenly goodness. I expected to bite into a big glob of cheesecake filling, but that's not what happened. The filling cooked into the crust, and it was one big, yummy, pillow of goodness. Seriously good. We drizzled blended strawberries over the top, and every last person loved them. There was a little 4 yr old boy in the group who sat eating his saying "Mmmmm... Mmmmm..."! His mom called it his "Yummy Motor"! After I snuck another pillow when cleaning up, I decided that these are going to be made again and again and again... they are even good cold! 2 cans of Crescent Roll dough. *Pillsbury now has a seamless crescent dough that makes this really easy. 2 packages cream cheese, softened. *You want this at room temperature so the filling isn't lumpy. Strawberries or chocolate for topping! Preheat the oven at 350. Spread the crescent roll dough out, and cut to fit your muffin tins. I used muffin top pans , but you can use regular muffin tins. The other option is to use an 9x13 pan, layer one crust on the bottom, spread the filling on top, and cover it with another layer of dough. Then you have cheesecake bars instead of pillows. 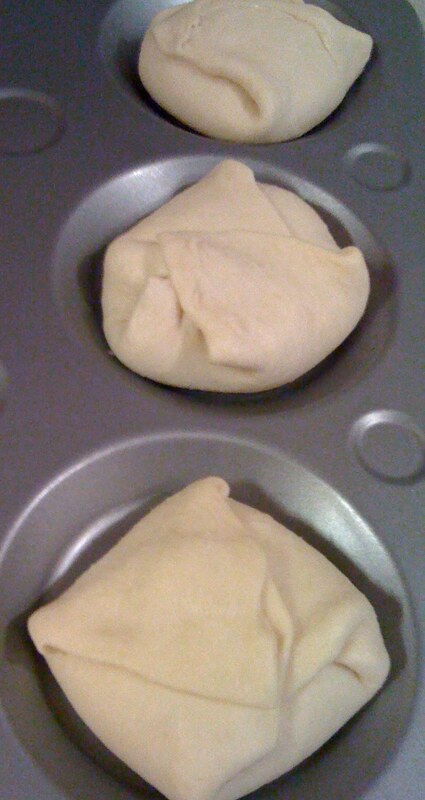 Once you have your dough placed in the tins, spoon roughly 1/2 cup of filling into the middle. Now, fold each corner up and over the filling. Try to enclose it completely. A few leaked after cooking, and deflated when cool, but they were still yummy! Melt the butter, and brush generously over each pillow. Mix the sugar and cinnamon together, and sprinkle over each pillow. Bake for 30 minutes, and let cool for 10 minutes. Drizzle strawberries or chocolate over the top and enjoy! How funny! I made something similar this weekend. I put crescent dough in the bottom of a 13X9 pan - mixed cream cheese with cinnamon, suggar and honey, then topped with another can of crescent dough - topped with melted butter, cinnamon, and sugar. There were no leftovers. 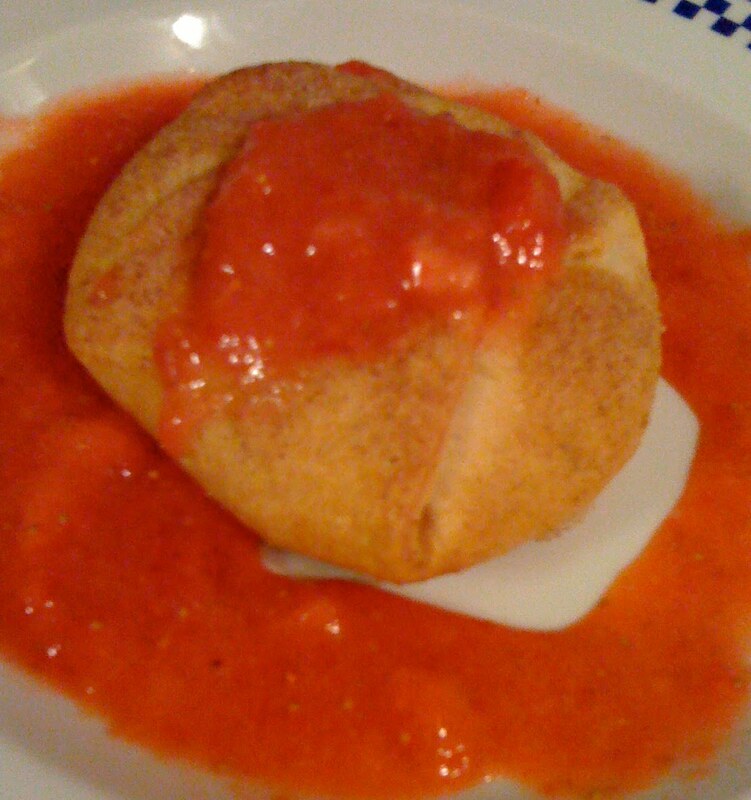 YUMMY... I like the pillow idea... can't wait to try this out. Simplysandi, honey sounds great too! I was just amazed at how yummy this was! Thanks for stopping by. mmmm, i may adapt my sopapilla cheesecake to pillows :) it's essentially the same ingredients, actually! Oh - I am dizzy with delight just thinking about this! What a yum dessert!I think that would go great with my lasagna dinner tonight! Thanks for the delicious recipe! And, Congrats on your SITS day to shine!!! Shine on! These look fabulous! Definitely bookmarking for fall! Happy SITS day and YUM!! I can't wait to try these. I love me some cheesecake, great recipe! Have a good week! I think I'm in love! They look incredible! Yum! I can NOT way to try this!!!!!!!!!!!!! Oh I'm going to try this receipe. They look heavenly! Hope you have a great SITS day! There are few recipes I call sinful but this might just be one. WOW! I am going to have to make these for someone at some point. My DH is not a cheesecake fan. Omg! This sounds so yummy! I can tell your blog is going to make me very very bad! It's 11PM and I am now drooling over the description and pictures. Yummy! You are definitely my new recipe resource! I sure wish you lived at my house and did all my cooking. It certainly would be heaven...all your creations look so delicious. www.FunnyPhotosContest.com. Submit CUTE or FUNNY photos and tell friends to vote. $2,000 in prizes. No entry fee.